These speakers are cheap but only on price. The 30-watt Cyber Acoustics CA-3602 2.1 Channel speaker produces amazing sound, looks stylish and is insanely affordable. You should buy the CA-3602 if gaming is all you do with occasional music and movies but nothing that demands precision. A 2.1 speaker system with an MP3 cradle, the Cyber Acoustics Subwoofer system offers a decent return on investment. Yes, there are cheaper alternatives to this PC speaker set but none that come close to its overall performance. Housed within a wood cabinet, this speaker produces booming and roaring bass performances like none other in its price range. Don’t get disheartened by the 50Hz to 20kHz frequency or its one-year warranty. It is a solid speaker with a handy control pod. The headphone output jack allows you to bypass the speakers altogether (when you don’t want to disturb your neighbors), AUX input to redirect audio from your gaming system, tablet or phone and a master control with volume and bass. The satellite speakers use 2-inch drivers with magnetic shielding for stereo separation and audio clarity. As for the subwoofer, it uses a 5.25 inch Power Pro bass driver that together with the wood cabinet ensures a thunderous bass performance. Affordable and yet so capable, this Cyber Acoustics speaker delivers 62 peak power watts and 30 RMS watts, sufficient for filling most average room sizes. EASY TO USE: The convenient control pod gives you full control over your sound system. Adjust the volume, turn it on and off, or use the headphone output jack for those private listening moments. With easy access to the 3.5mm aux input, you can quickly connect your cell phone, tablet, MP3 player, or gaming system to really pump up the sound. Plus bass volume control allows you to fine tune the richness of the sound just the way you like it. RICH AUDIO: The ported 5.25" subwoofer delivers some of the deepest bass available, powerful for any audio experience, along with the satellites using twin 2" drivers deliver crisp, clean, optimized sound. For speakers that cost less than $40, you really cannot keep high expectations. The brand, setup, and extras do not matter. Cyber Acoustics isn’t a brand name that you would look for exclusively if you wanted a gaming speaker and yet here we are. At such a small price tag, all you need is decent sound quality and the ability to fill a reasonably sized room. The CA 3602 does just that while giving you the option to play from an auxiliary source such as a phone, tablet or another gaming device. When we were deciding on the top gaming speakers, we found the Cyber Acoustics CA 3602 was famous with budget gamers, and that is really the reason why we decided to buy one. This isn’t THX certified, obviously. It isn’t correctly configured for games neither does it boast of an impressive frequency response. What it does well, however, is produce a thunderous performance at reasonable settings. What do we mean by reasonable settings? First, the room should not be large if you want the speakers to fill every corner. It certainly won’t impress you outdoors. Second, you have to tweak sound profiles on your PC to get the right output. If you do not have an equalizer, then this speaker might not perform all that well for you. Third and finally, never exceed 75% of total output. Though in our tests, it performed well beyond 75% volume, anything heavy on the bass or top will muddy the sound profile. If you think your usage falls within these reasonable settings then the Cyber Acoustics CA 3602 speaker is perfect for you. Remember, there are better options out there if you can spend more than $40. Playing Battlefield One, we noticed that the speakers managed to spatially separate approaching footsteps. Though the separation only gives you an indication of the general direction, it isn’t specific until they come closer. On less aurally immersive games though the speaker performs well. Music is definitely one of the things we want our speakers to be adept at. After all, a lot of games have background scores that add to the experience. Listening to heavy bass tracks is a bit disappointing but not something to complain about. Yes, highs roll off a little, and at high volumes, frequencies muddle up a bit. However, compared to the Klipsch 2.1 THX speakers, the difference in music quality is no more than 25%. What truly surprised us was the addition of the control pod. The controls on this speaker are all centered on the pod including the Volume and Bass knobs. Logitech has a similar control pod for some of its speakers, but most do not give you Bass controls. Cyber Acoustics even includes an AUX and Headphone Line. The cable is long enough to sit close to your keyboard and mouse setup so you can plug in your favorite pair of headphones when you want to get closer to the battlefield. Alternatively, the AUX lets you connect with your smartphone or tablet. It will even work with a gaming console. The satellite speakers are top heavy with a small base. The design does not inspire confidence as it topples easily. Be careful when cleaning around the speakers. They used plastic for the satellite pieces, and it isn’t top grade so a few falls might just break them. We know these speakers are inexpensive but, Cyber Acoustics really could do with a design overhaul, at least make the base larger for more stability. The speakers are clear and crisp at reasonable settings. Control pod has a headphone out, AUX port, on/off switch and volume/bass knobs. The subwoofer is wood with 25-inch drivers. Satellite speaker separation is not bad with suitably long wires. Inexpensive and yet highly capable speakers. The design of the satellite speakers does not inspire confidence. They easily topple over with a slight nudge. The Bass is shaky as you go beyond 75% volume. Could do with more overall volume. Gaming speakers do not exactly give you anything extra other than a few gaming specific options or settings. The Cyber Acoustics CA-3602 is a decent speaker in its own right. It holds up well when gaming and doubles up as an excellent all-purpose speaker, all within a small budget. 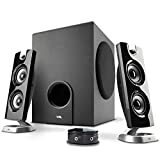 If you want a quick and dirty replacement for your aging speaker or are low on funds, this speaker will keep you satisfied until you are ready to make the jump to higher models.